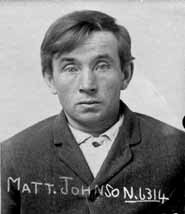 Allegations: On April 19, 1918, said in a saloon in Milltown that the U.S. Liberty Bonds were no good. That the government would not back them up. That the man that bought them would never get his money back. That he would lose it. That the U.S. government is no good. Case Details: Pled guilty upon advice of appointed counsel. Served 13 months from May 25, 1918, to June 18,1918, or 13 months in prison, working as a laundryman. Personal Information: Born in Finland. Got U.S. citizenship in 1907; Lumberjack. In Montana 7 years. Resident of Bonner. He and wife Minna, age 53, were both inmates at the Montana State Hospital at Warm Springs in Deer Lodge County in 1930. Date and place of death unknown.